Most people know how strict is Australian quarantine at airports and people are not allowed to bring any unprocessed food. But that is not it. All traveller should be aware about interstate quarantine. 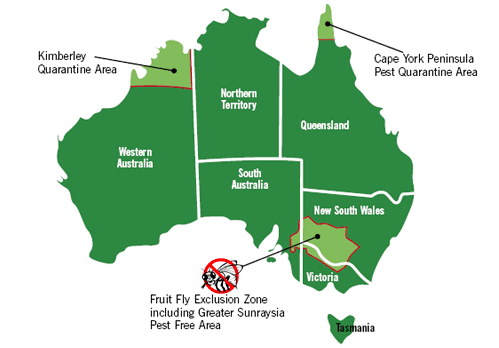 To avoid spread pests, diseases and weeds from one part of Australia to another there are restrictions what you can take from one state to another, or even from one part to another place in the same state. I never saw inspectors on the road, but better to be prepared and not to buy restricted food (especially fresh fruits) before crossing one of interstate or quarantine borders. Traveller’s guide to Australian interstate quarantine can be found here. I am flying from Canberra to Qld. Can I take fruit and veg with me? That’s a good move by the Australian government to prevent the spread of pests and diseases. We are driving from WA to SA, then NT before crossing to Qld. What fruit & vegetables are we allowed to take across the borders. The brochure online simply says “ASK” for everything! And the “Further Information” on pp 13-15 are not included in the online version. So we don’t know who to ask! Ray, I drove from SA to WA and was forced throw out my apples and tomatoes. The only fruits/vegetables I had. The safest way probably would be to call the number provided on their website. But you’re a bit short on specific info, and I wonder if the number is a 7-days thing (must check the website again), as we’re heading out Monday for Norseman & Points East. Ray, I posted this just to inform people about the quarantine situation, as I wasn’t aware about it. It always is better to check official website for up to date information. p.s. Ray, can you inform how it went after your trip?